STARBUCKS in Japan also has free-WiFi! Do you know how to connect it? STARBUCKS in Japan also has free-WiFi! Starbucks Coffee opened about 200 stores in Tokyo, about 1,000 stores in Japan. 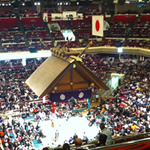 The number of stores in Japan is the third rank in the world, after the USA and Canada. Starbucks is famous for free WiFi in USA, it's also famous for free WiFi in Japan. However, connecting Starbucks' WiFi in Japan is more difficult than it in USA because you must receive e-mail for confirming ID and password after inputing your e-mail address(See below for details). 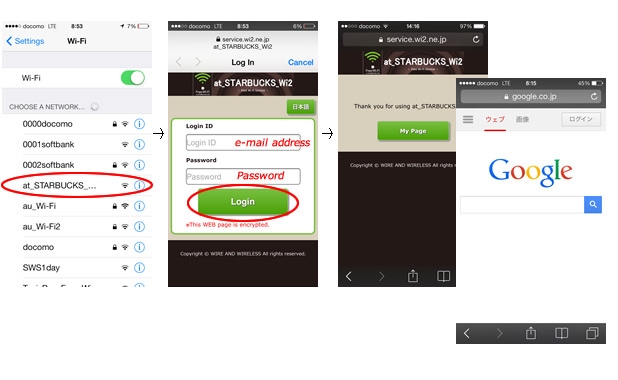 You can get ID and password easily from Starbucks' free-WiFi page in English. You can connect to this WiFi by inputing e-mail address and password. By the way, Starbucks in Japan is offering many limited-time drinks only in Japan such as SAKURA series, Hojicha(roasted green tea) series and Green tea series. Recently, they offered limited drinks not related Japan like Chocolate Pretzels Mocha Frappuccino. 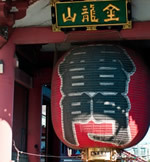 In addition, Starbucks at Meguro in Tokyo is designed based on Japanese culture and soul, its drink counter used Chashitsu(tea room) as reference. You may be fascinated there though you go there for free wifi. 7-Eleven is free-WiFi spot and has ATMs you can withdraw cash in Japan!